If I am working with my cameras and I don’t have my strap attached I invariably get asked by curious onlookers what those weird little red and black pill things are sticking off my camera. If I’m feeling playful I tell them that they are mood sensors and if they put it in their mouth for a second I will be able to read their mood through the camera. Or something equally ridiculous. Usually though I will tell them the truth. They’re Peak Design anchors for my camera straps, which allow me to remove the straps as easily as a Burlesque dancer removes hers. I’ve never been a fan of the ubiquitous camera strap that gets supplied with every new camera. With all the branding that is usually emblazoned on them they look unrefined and just plain yuck. They’re also awkward and uncomfortable and they never fit properly into your camera bag. I suppose they are essential though, because not everyone who buys a camera gets a firm grip on it. In more than one sense. So when I discovered the Peak Design range of grips and straps I was instantly sold on the simplicity of the design and how they can be stowed in other parts of your bag instead of having them stay on the camera. You can literally remove the strap with one hand in an instant, and unlike the ghastly things the cameras manufacturer’s supply which have to be threaded into eyelets using a buckle and a thinner strap, the Peak Design Anchors loop around the eyelet and then clip into the anchor links on the strap itself, providing a firm means of support. I can almost hear the collective “Duh! Why didn’t we think of that?” coming from camera factories in Japan. 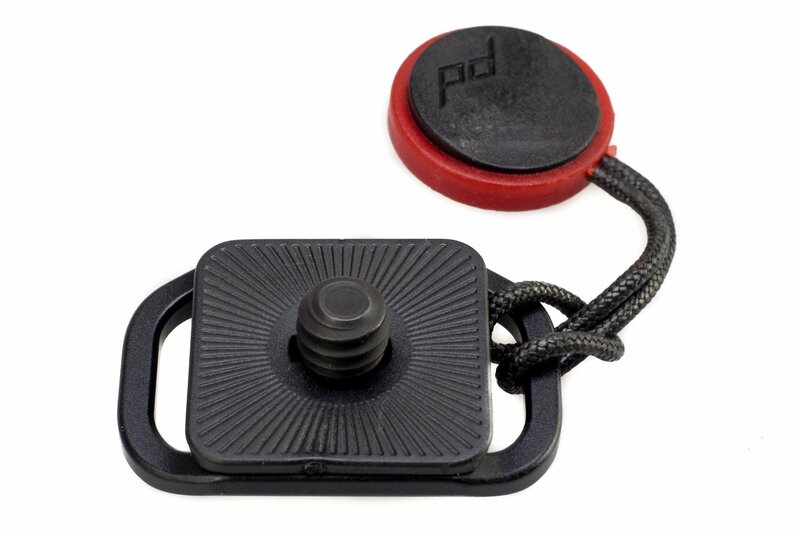 Originally I was using the PD Slide and Leash products, which I reviewed a few years back here on FZ. The Leash was the one I took to most, simply because it worked better for me with the smaller Olympus E-M1 cameras I use. I ended up selling the Slide and using the money to buy a second Leash. When I am working events I have them criss-crossed over my torso like Rambo wears ammunition belts. Sometimes I wear them both on the same side but I slacken one of them so that it is pretty long and the other one I shorten so that the cameras don’t touch each other. The reason for this is because sometimes at events I also have to carry my bag around with me and there’s nothing more annoying than having your camera straps get entangled with the bag. It’s a quick recipe for public embarrassment. I speak from experience. Anyway, a few months back when I was still active on the now useless Facebook, I came across a post by somebody saying that Peak Design were replacing all their old anchors with a new, tougher version and if you still were using the old ones they would send you a set of replacements for free. It just so happened that I have several sets of the old ones. They were all fine, but PD didn’t want to risk anybody having a failure so they sent me some more. 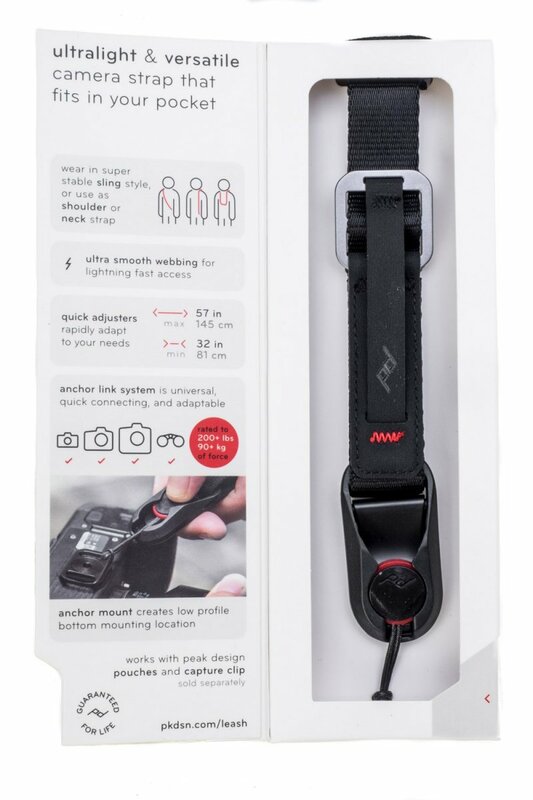 They also sent me an update of the Peak Design Leash, which as you have already read, is my preferred camera strap. The box and what's inside it. So what’s changed between this new one and the old one? Well, it’s a lot better, in my opinion. It’s now possible to shorten it at both ends and not only one. Also, the buckles are made from metal and not plastic, which adds to the overall more refined look. Oh yes, they also sewed in some loops that make adjusting the length of the leash just a little easier with a single finger too. I have also noticed that the nylon material they are using for this latest incarnation is a little less supple, which means that it’s less likely to fold over on itself when you are adjusting the length. This has happened to me with the older one. They are also now including a small plate that you can affix to your camera's tripod thread to make using the bandolier style a little easier. You can wear the leash in a variety of different ways, including as a traditional neck strap (bleh! ), a bandolier strap (like me and Rambo), or as a tether should you go rock climbing with it. It’s still my favourite strap and if you’re looking for something easy to remove and re-attach, plus give you a bit of versatility in how you use it, the Leash is definitely something you should consider. You can buy it online from Peak Design or your favourite retailers. Fotozones is not affiliated to Peak Design. Manufacturers sometimes send us things and if we like them we review them. If your company would like us to review something, please get in touch. This statement begs the question, just how long have you been scrutinising burlesque dancers removing their straps? This of course begs another question what does Mrs Dahms think of your scrutiny of these exotic dancing ladies taking their clothes off? Oh and I also like Peak Design straps, including their wrist strap! Yeah I know, I was military myself, but a volunteer! So I too have been to a few places! Oh no, far too done up compared to the (ahem) artistes we got to see down at the local pub for "steak, egg & strips" on a Friday afternoon. 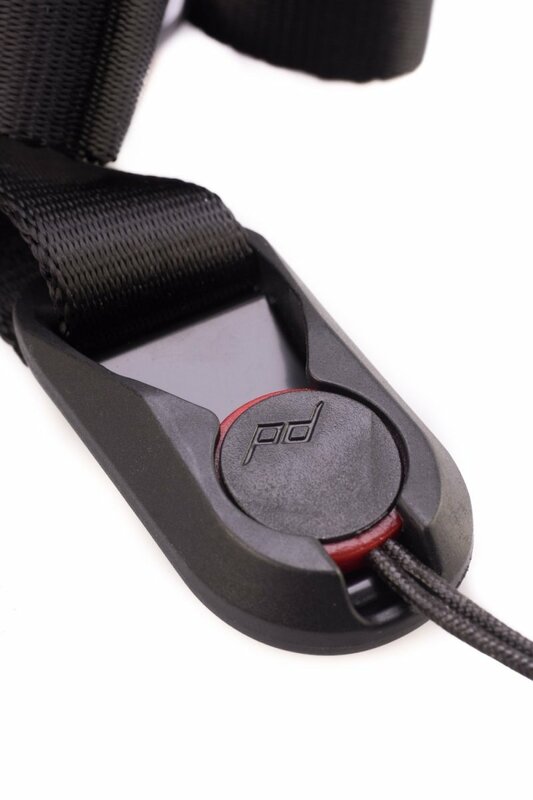 I don’t know if you have one but I can recommend the PD wrist strap! Do you mean the Clutch? I have one and somewhere on FZ there is a review I wrote of it. Great piece of equipment! Dallas, no I meant the Cuff, which sadly seems to be no longer available! The Cuff is still on the PD website. Wex stocks it. Same with the Clutch. True Anthony, but out of stock with no indication when stock will be available, that is unless the situation has changed since yesterday! The design of the Cuff has changed and the price has risen a lot! 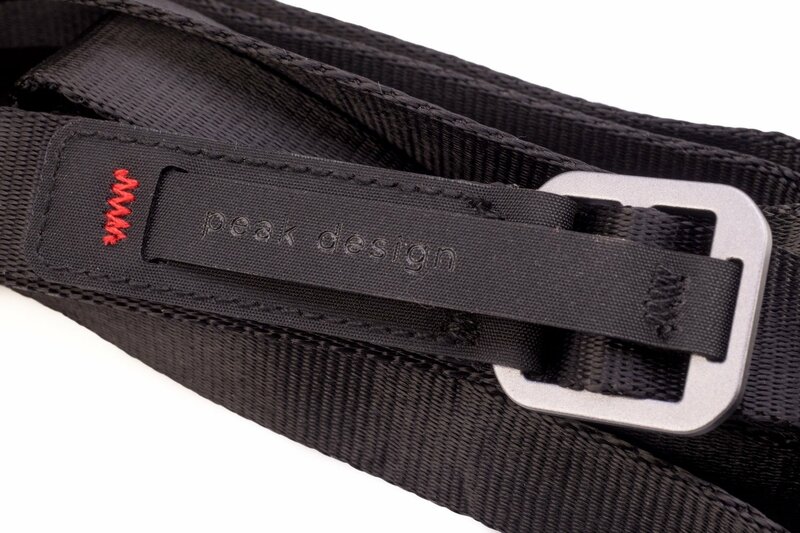 We have Peak Design straps on all of our OMD bodies. Love how fast you can change the length of the straps if you to do something like carrying two bodies with one held at chest level and the other on the side of your hip. 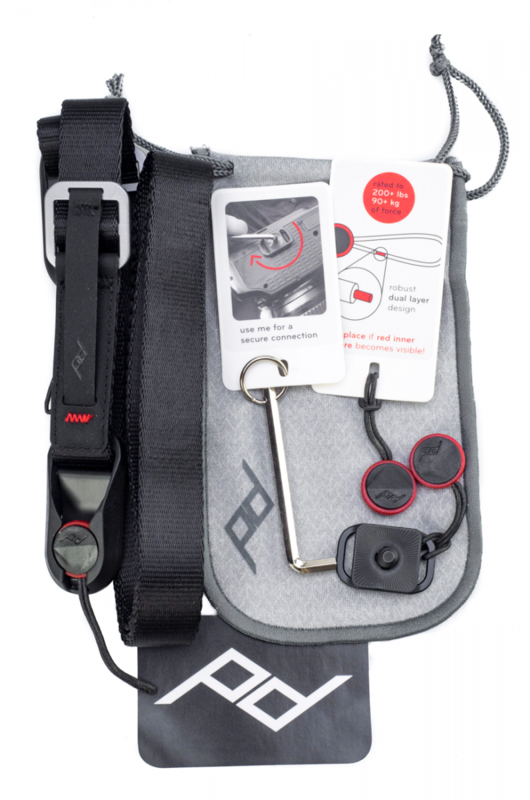 Last week I reviewed the Peak Design hand strap they call Clutch. This week I am taking a look at two of Peak Design’s camera straps, namely Leash and Slide. These are probably the most useful and versatile camera straps I’ve had the pleasure of using. As I said in my review of Clutch, I really don’t like the neck straps you normally get when you buy a camera, mainly because they get in my way during packing my gear and are very uncomfortable to wear. The trouble with this approach when I am covering an event is that when I am using two cameras and I don’t have a strap to sling the unused camera over my shoulder, I either have to lay it at my feet or figure something else out. Both Slide and Leash solve this problem by letting me wear my cameras “bandolier” style across my body. This is because they are both length adjustable, something you don’t get with a “default” neck strap. So, if I am wearing my second camera across my torso, I can easily put the primary camera in my right hand and slide the second one up to shoot using my right hand. Another major benefit of carrying your camera across your torso this way is that it doesn’t swing around while you are moving like a neck strap would. If you have to bend down to get something out of a bag, provided you have positioned your Leash or Slide strap so that your camera sits around waist height, it won’t dangle like it would if you were using a traditional neck strap. It works for me. OK, so these two straps do similar things but each of them have their own unique features which may affect which of them you wish to purchase. First off let’s look at Slide. Slide is designed for large heavy DSLR’s or medium format rigs, but can be used on any camera if you are comfortable with the width of the strap. It’s 45mm across, so not exactly a thin strap. On either end you will find the Peak Design clips where you can slot in the Anchor Links that you will have looped through your cameras strap lug points, or if you have used the supplied ARCA style plate that comes with Slide, attach it to the bottom (it’s necessary to use that point if you want to use the “bandolier” style of wearing your camera). It goes on and off lickety split using those anchor links. Also on either side of the strap you will see buckles that have loops on them. These are what make Slide so easily adjustable. All you need to do is hook a finger in one of them and while bracing at the anchor point with one hand, tug up and the strap slides shorter. Pull down to make it longer. It really works well and makes this strap very easy to adjust quickly. If you look at the first photo of Slide above you will notice that the middle section of Slide is a little stiff looking. That’s because they have some padding in there as well as on the overside there is some rubberising for when you need to wear it on the shoulder and not have it slip off your shoulder. The stiff section isn’t as stiff as you’d think and its still possible to roll the strap up around your fist and not have it unravel (see pic above). Leash is a much thinner strap, measuring only 20mm across its breadth. It also has the Peak Design Anchor Link receivers on either end so if you have an extra Peak Design ARCA style plate you can also attach it to the bottom of your camera and use it bandolier style. The main difference with Leash when compared to Slide is that it has only one length adjustment buckle, so the doubled up section of strap is much longer, which gives the impression that it isn’t as neat looking as Slide. On the buckle section of Leash there is also another Anchor Link, so you can create a loop on one side of the strap that you could attach to your belt if you were going climbing and wanted to make sure that your camera didn’t fall too far. Personally I’m not planning on doing any mountaineering with my cameras courtesy of an in-built personal safety feature that I have: I don’t do heights! So which of these two straps should you choose? Well, Leash is great, but I think I prefer Slide on my Olympus E-M1. It just feels a little more refined than Leash. 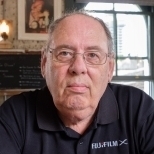 The good news is that Peak Design have announced that a revised version of Slide called SlideLITE which they designed specifically for smaller mirrorless cameras will be shipping really soon (like next month). It will be a bit thinner than Slide at 32mm and also dispenses with the internal padding I mentioned. I think I will definitely want one of those. All in all these are very cool and worthwhile products for photographers looking for straps that do more than the uncool neck straps that came with your camera. Click this link to order directly from Peak Design and support Fotozones. As a professional photographer one thing I have come to despise over the years are camera neck straps. I find them cumbersome and clumsy. I much prefer to use hand straps as these allow you to hold the camera securely and for me they are a lot more comfortable than wrapping the neck strap around your wrist a few times. I’ve had a number of hand straps over the years, some good, some bad, but I’ve never had a hand strap quite like Peak Design’s “Clutch”. It addresses a common problem with hand straps that no other brand I have tried does. Let me explain; often hand straps are designed to be snug fitting, but inherent in this snugness is restriction of wrist movement and when you need to move your index finger or thumb to other buttons and dials you either need to have really long fingers, or you need to remove your hand from the strap completely. It’s a pain I encountered on my recent safari where when I wanted to shoot video instead of stills on my Olympus OM-D E-M1 I had to take my hand out of the Olympus GS-5 to reach the record button. The Clutch is a very clever design that prevents this from being a problem. Not only is the strap exceedingly simple to attach to your camera by using Peak’s patented quick release Anchor Links, its snugness can be adjusted really quickly, simply by lifting the buckle (which is cleverly situated on the outside of the grip, as opposed to the inside where most other manufacturers place it). This gives your wrist more room to move when making adjustments with your index finger and when you want the grip to be tighter you simply pull down on the adjustment strap. It is actually brilliantly simple design! Clutch comes with an ARCA style plate that attaches to the tripod socket of your camera and a couple of Anchor Links. Once you loop the top part of Clutch through your normal camera strap lug on top of the camera, you attach the bottom part to the plate using the Anchor Links. It goes on and comes off in a matter of seconds, unlike some of my other hand straps which require masterful disassembly and reassembly, one of which (made by Canon) I never quite got right the first time I took it off. Included in the packaging is a soft pouch (looks like a sunglasses case with a drawstring) that you can store it in, as well as a 4mm Alley Key with a key chain loop so that people like me who are forever losing these things can keep one attached to their camera bag (or bunch of keys). Stay tuned for reviews of Slide, Leash and Capture Pro in the weeks ahead, but in the meantime if you have any questions about Clutch please just pop them in the comments and I will address them.